Astronaut Samantha Cristoforetti, the record-holder for the longest continuous spaceflight by a woman, joined on as a cast member in the fan project "Star Trek: Axanar." 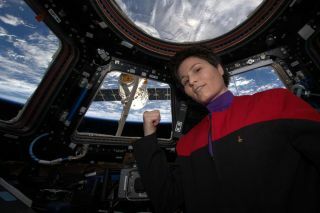 In April, she tweeted this photo posing in the International Space Station in a "Star Trek: Voyager"-style uniform. The news comes as the production wrapped up a crowdfunding campaign that raised $487,076, nearly double the original goal of $250,000. Filming will begin in early 2016. "Star Trek: Axanar" follows the story of Garth of Izar, a character who was introduced in the "Star Trek: The Original Series" episode "Whom Gods Destroy." Garth's story takes place about 21 years before the events of the first "Star Trek" episode, "Where No Man Has Gone Before." The new, full-length film will follow from a 20-minute crowdfunded prelude that was released last year. Stars in the feature-length film include Richard Hatch, Kate Vernon (both of "Battlestar: Galactica"), Gary Graham ("Star Trek: Enterprise") and Tony Todd ("Candyman", "Chuck", "24"). It is led by Executive Producer Alec Peters. After a crowdfunding campaign last year on Kickstarter that raised more than $600,000, the filmmakers have decided to break the feature-length film into four episodes costing at least $250,000 each. The base goal for the work is $1 million, but the filmmakers need at least $1.32 million in total to cover costs from using the crowdfunding site Indiegogo, which takes a cut of projects funded on its site, as well as "ongoing studio costs" and "payment processing," according to the Indiegogo page.